Knit Now is for the beginner or advanced knitter. Learn techniques in the step-by-step instructions from expert knitters. 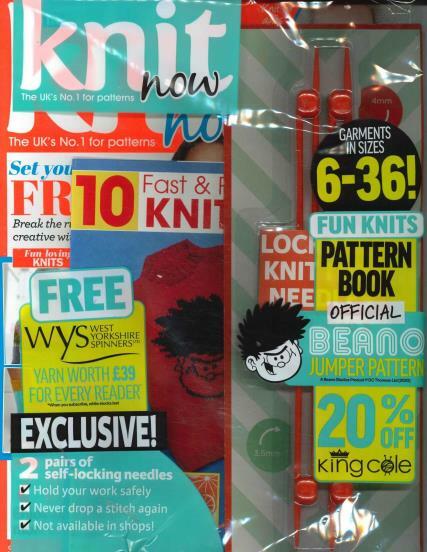 Buy a single copy or subscription to Knit Now magazine. Everyone loves to receive a homemade knitted gift. Get inspiring ideas for your next knitted project. Get the colorful, step-by-step guides to a new afghan or baby clothes. Learn how to make baby booties or sweaters. Knit a warm scarf or hat. Get quick, easy to follow patterns in each issue. Stay current in product news and trends. Get advice, hints and tips from professional knitters. Discover the yarns that make the best clothes, or which ones to purchase for afghans and throws. Find out how to buy knitting needles and how to finish the edging of a project to make it look professional. Learn from the experts on sizing your project or what to do if you drop a stitch. Get new patterns for your next project. Learn how to design your own project or how to customize a pattern for your own use. Craft Section gives you ideas to decorate your home for holidays or give as gifts. Learn how to make lovely Christmas decorations for the tree, or discover how to make a tea cozy or wall hanging. Best patterns that you will want to make, well rounded content, and the editor Kate Heppell has been with since issue 1 and has grown this magazine into the best of both US and UK markets. I purchase every issue of both countries knitting and crochet magazines that are available each month.